Interior designer Malcolm James Kutner '94 creates rooms with a view. Malcolm James Kutner '94 sits at his desk in the second-floor office of his Key West home, sifting through luxurious fabric samples. Exquisite cottons, glazed linens, silks, a finely napped linen velvet woven exclusively by an English mill. All the samples are dipped in the palette of nature: chestnuts, mustards, russets, greens of every hue. It is an element of Kutner's decorating aesthetic to bring nature indoors, in part by working in natural materials such as stone, wood, cotton, wool. Though many of the fabrics, furniture, wall- and floor-coverings he recommends carry substantial price tags, he stands upon no ceremony. He may suggest a priceless antique desk to a client who spends the workday writing, but he is not above putting a Pottery Barn lampshade on an antique base. The endeavor transcends decor. For Kutner isn't simply a talented interior designer whose artistry wins admiration from clients and critics alike. His work is so striking because it embodies a Kenyon-style liberal arts ideal--an aesthetic rooted in scholarship, history, a fine sensitivity to text (both literal and figurative), and an appreciation for the interwoven influences that define civilization. Eighteenth-century poet Alexander Pope wrote of Genius loci, the "genius of the place." Part of Kutner's work is to discover that genius, although he has learned that "sometimes, frankly, you have to create one." Created or discovered, the genius of his own two homes has begun to garner attention in the critical and popular press. His Key West domicile, originally built by a nineteenth-century Cuban cigar importer, was featured in the May 2006 issue of House Beautiful; another of his projects will appear in an upcoming issue of Elle Decor. Articles about his restored eighteenth-century home in London have been published in England. His reputation is growing as well by word of mouth among clients who find his services practically indispensable. While design principles of scale, proportion, usability, beauty, and durability inform his choices, if there is a signature to Kutner's interiors it would be comfort, "a worn, lived-in look." It's a signature that appeals to a growing list of clients, including a group of highly successful writers in Key West, Martha's Vineyard, and New York. He counts among his current clientele two of the foremost American authors of adolescent literature--Judy Blume (Are You There, God? It's Me, Margaret, along with numerous other books) and her husband, George Cooper; and Meg Cabot (The Princess Diaries) and her husband, Benjamin Egnatz. Chaos author James Gleick and his wife, Cynthia Crossen, are also Kutner clients. Blume and Cooper, owners of a mid-twentieth century gem of a home in Key West, are among Kutner's biggest fans. "I love the creative collaboration," says Blume of working with him. "He approaches his work with certainty, yet he's never tried to impose anything on me. I haven't added up what the whole project has cost; I only know that it's worth it." Adds Cooper: "We couldn't live without Malcolm." The work of recreating a home binds the owner and decorator in a close relationship. The acclaimed twentieth-century American designer William Pahlmann went so far as to compare choosing a couch with getting therapy on the couch, when he observed that "with the exception of psychoanalysis, there is probably no other field of civilized endeavor in which the personalities of client and advisor are in such violent conflict or harmonious cooperation as interior decoration." Kutner and his clients select each other carefully, seeking the harmonious end of the spectrum. The decorator is thoroughly at home in his role as advisor and confidant. "I'm so much in the personal realm of my clients' lives," says Kutner. Decorating a house means setting the stage where real life is conducted: home is where we eat, sleep, work, get sick. The designing of domestic space is, finally, an intimate act. It requires learning how clients use space, spending time with them in the home, asking many questions. At the end of the process a designer knows not only how his clients live but how they converse, how they fight, how they speak to their children, where they keep their underwear, whether they like a square or rectangular box of tissues on their bedside table. Pleased as he is with his current roster, Kutner has faced some challenges among his former clients. One client would spend any amount of money on kitchen and bath but would use only the least expensive bed linens. Another was willing to pay double for a custom-made bathtub only two inches longer than standard. Still another wanted a window that could keep out animals, burglars, and pests, allow those in the home to see out but no one outside to see in, and still let a breeze in. "I had to tell her there is no such window," he recalls. "Something on this list must go." Having restored and decorated two homes of his own--having been his own client, in effect--he has empathy even for the homeowner who needed to see more than two hundred breakfast sets before selecting one. "It's so much harder to do your own home. You know how much is out there to choose from. The decisions can be painful." But the effect is admirable. Says his Kenyon mentor and current friend Associate Professor of English Deborah Laycock, who has visited Kutner's homes in Key West and London, "You see anything he's created and you think, 'that's how it should be.'" When Kutner (then known as Jay) was a Kenyon senior working on an English honors project in eighteenth-century literature, he didn't imagine that within a decade he would be the co-owner, restorer, and decorator of an eighteenth-century home in London that would be written up in magazines. Laycock, who mentored his work on Restoration drama, puts it this way: "I teach the eighteenth century, but Jay lives it." Part of the time, that is. 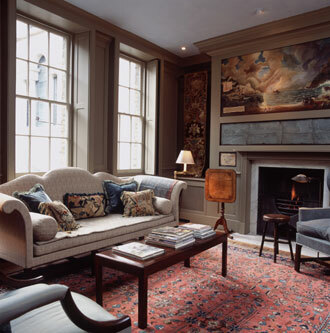 When he is not traveling the globe sourcing furniture, textiles, lamps, and accents to express the essence of his clients' homes, Kutner divides his time between his historic Key West home and his terrace house dating to 1724 on Fournier Street in the Spitalfields section of London. The house was in a state of sad disrepair when Kutner and his partner of ten years, an American who has long lived in London, first saw it in 1999. "When we bought the place, the stairway down to the basement kitchen had been destroyed. There was just a ladder projecting down through a hole in the ceiling," says Kutner, recalling the two and a half years of planning and labor that went into the modernization and decoration of the home. The house had begun its life with a fairly distinguished pedigree, having been built by prosperous Huguenots (Protestants) who fled France to escape religious persecution. Fine wooden paneling and elaborate joinery by the master craftsmen of the day characterized the construction. The five-story building, twenty-five feet wide, originally housed a workshop for silk weavers, still recognizable by the large attic-floor windows which let light into the room where the loom would have been kept. Today this chamber is Kutner's bedroom, and the windows frame a full view of Christ Church, designed by architect Nicholas Hawksmoor in the Georgian Baroque style and completed in 1729. The house had declined from its prosperous beginnings over centuries of varied use. From the Victorian period onward, its neighborhood became a magnet for successive waves of immigrant populations, including Irish dockworkers, Jewish refugees from Eastern European pogroms, and Bangladeshis. Kutner's home once housed a sweatshop, and even today the area remains connected with the textile trade. A nearby house of worship has enjoyed several lives, as a Huguenot chapel, a Methodist church, a Jewish synagogue, and (today) a mosque. The renaissance of Fournier Street, one of the best preserved rows of domestic Georgian town houses in England, is a case study in urban renewal. Kutner approached the London house, as he does his clients' projects, with the soul of a scholar animated by the spirit of a creative artist. "Every decorating project is like a dissertation," says the former English and Spanish major who holds one master's degree in critical theory and another in garden and landscape design. "It takes research, close reading of spaces, analysis, the posing of questions, problem-solving, and--once I have the concept--an editing process as well, turning coal into diamond. Kenyon gave me a methodology and a foundation. Interpreting a space or a design is much like interpreting a text." Kutner restored the house to a restrained elegance that is part eighteenth century, part twenty-first. The home's Georgian roots are still visible in the dining room of the house, for example, which has never been electrified and is illuminated by an eighteenth-century Dutch candle chandelier. But the master bedroom holds all the modern conveniences. Laycock, who toured the home and the Spitalfields area with her Kenyon-Exeter students at Kutner's invitation in 2003, is quick to point out that the house is not a reconstruction. "He doesn't create a museum. The house is his version of what he imagines the eighteenth-century owners would do if they lived there now. He updates with a sense of humor." Kutner's sense of humor and his scholarship coalesce in the mural he commissioned for the wall over the living-room fireplace. A pastiche and a fantasy, the painting upon close inspection reveals a layering of historical, artistic, and literary allusion that can be fully understood only by reference to the details and passions of Kutner's life. The mural depicts a shipwreck during a tempest. A castle and hills visible in the background reflect the sublime influence of Italian Gothic painters such as Piranesi. In the lower right, a wrecked ship based on the Trinidada in Canto II of Lord Byron's Don Juan is being looted of its cargo of oriental silks, an allusion to the Spitalfields silk fortune that built the house. In the lower left, contemporary figures swimming in a circle are identified by the jeans and t-shirts they've strewn on the beach. They are overlooked by a woman in a black cape, based on a current Spitalfields neighborhood busybody. Included are portraits of Kutner's two dogs, one on the beach and the other off in a grotto in company with a figure who, upon examination, proves to be a representation of Laycock herself. To the left of the fireplace appears the Latin quote used by Dr. Samuel Johnson as the motto of The Rambler, Quo me cunqeu rapit tempestas, deferor hospes ("For as the tempest drives, I shape my way"). The bottom lefthand corner of the mural holds a legend from Shakespeare's The Tempest. With its blending of the sublime and the ridiculous, image and text, artistic conventions and literary allusions, history and the current hour, the mural inscribes directly into the walls of Kutner's house nearly everything that is of interest to him. It's a visual sign of what Kutner means when he talks about his orientation toward his work. "I have a multidisciplinary way of approaching interior decoration," he says. "It is practically a liberal arts curriculum. My liberal arts curriculum."